Hello again! Finally a post about something other than Art!! About the other story = It is three hours before midnight and the whole city is awaiting attack from 1600 deadly dwarf archers and 200 men of the fierce land of Dalya. The Prince of the Land Beyond the Mountains has just brought aid of 100 soldiers and as many horsemen with spears. Are you absolutely terrified? If you are, good, let’s go on with the blog post. Prince Roland of the Land Beyond the Mountains bids the Princess Helena of Adnohr farewell while preparations for battle goes on in the background amongst the king’s archers and foot soldiers and also the prince’s foot soldiers who have come to aid Adnohr. 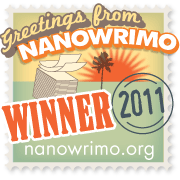 Alas, they have to wait, as I'm too busy writing the NANO story. Also, these folks at Phantom Moose are making videos of a person writing a NANO story: We watched the first video and it was really amusing! Go see. Well, Goodbye, Folks, for I’ve got 5 pages of my NANO novel to write, so- Fare you well wherever you fare ‘til your eyries receive you at the journeys end.